"In Numbers 19, Moses wrote these inspired instructions regarding the mysterious sacrifice of the Red Heifer: "Then the heifer shall be burned in his sight: its hide, its flesh, its blood, and the offal shall be burned. And the priest shall take cedar wood and hyssop and scarlet, and cast them into the midst of the fire burning the heifer. Then the priest shall wash his clothes, he shall bathe in water, and afterward he shall come into the camp; the priest shall be unclean until evening. And the one who burns it shall wash his clothes in water, bathe in water, and shall be unclean until evening. Then a man who is clean shall gather up the ashes of the heifer, and store them outside the camp in a clean place; and they shall be kept for the congregation of the children of Israel for the water of purification; it is purifying from sin. And the one who gathers the ashes of the heifer shall wash his cloths, and be unclean until evening. It shall be a statute forever to the children of Israel and to the stranger who sojourns among them. He who touches the dead body of anyone shall be unclean seven days. He shall purify himself with the water on the third day and on the seventh day; then he will be clean. But if he does not purify himself on the third day and on the seventh day, he will not be clean. Whoever touches the body of anyone who has died, and does not purify himself, defiles the tabernacle of the Lord. That person shall be cut off from Israel. He shall be unclean, because the water of purification was not sprinkled on him; his uncleanness is still on him." Jesus In The Red Heifer? Some believe that the significance of the heifer being "red" is symbolic of the red blood of the Messiah Jesus without which there can be no cleansing. Many feel that the sacrifice of the "red heifer" in some ways reminds us of what Christ had to offer. This red heifer sacrifice points us toward the ultimate sacrifice of Messiah, which is able to accomplish so much more than to "purify the flesh". Remember that the red heifer was to be "without spot" (Num 19:2). Paul teaches about this in the book of Hebrews. Hebrews 9:13-15 For if the blood of bulls and goats and the ashes of a heifer, sprinkling the unclean, sanctifies for the purifying of the flesh, how much more shall the blood of Christ, who through the eternal Spirit offered Himself without spot to God, cleanse your conscience from dead works to serve the living God? And for this reason He is the Mediator of the new covenant, by means of death, for the redemption of the transgressions under the first covenant, that those who are called may receive the promise of the eternal inheritance. "The Talmud claims that the Red Heifer sacrifice was the only one of God's commands that King Solomon, the wisest man who ever lived, claimed he did not understand. Although the priest obediently offered the sacrifice as demanded by God, Solomon apparently did not understand why Numbers 19 declared that the priest would be "unclean until evening." This unusual sacrifice symbolically pointed to Jesus Christ and His sacrifice because our Lord, who was perfectly sinless, judicially took upon Himself the sins of the world so that we who are sinful could become righteous before God. Christ paid the price for our sins. We have an altar, from which those who serve the tabernacle have no right to eat. For the bodies of those animals whose blood is brought into the holy place by the high priest as an offering for sin, are burned outside the camp. Therefore Jesus also, that He might sanctify the people through His own blood, suffered outside the gate. Therefore let us go forth to Him, outside the camp, bearing His reproach. "Waters from the pool of Siloam were used in the ordinance of the red heifer described in Numbers 19, where Moses was instructed to mix "running" (lit. living ) water with the ashes of the red heifer. The water had to be fresh, able to give life, not stagnant. This mixture of water and ashes was sprinkled on those who had become unclean to purify them. This same Pool of Siloam is also referred to in the New Testament. It was to this pool that the Lord Jesus sent a man, blind from birth, to wash off the clay that He had applied to the man's eyes. After washing in the pool, the man received his sight (John 9:6-7). The Pool of Siloam not only held historical significance, but in Jewish tradition it also had a prophetic connotation. First, the Jewish Scriptures speak of a time when, like water poured "upon him that is thirsty, and floods upon the dry ground," God will pour out His Spirit upon all flesh (Isaiah 44:3). Because the waters of Siloam were used to anoint the kings of the house of David, and that anointing was symbolic of the Holy Spirit coming upon an individual (1 Sam. 16:13), the living waters of Siloam became associated with the outpouring of the Holy Spirit. June 20, 2014 Red Heifer Born: In January of 2014 a Red Heifer was born in the United States. At the present time (June 2014) it has been inspected and deemed to qualify as an acceptable red heifer for a temple animal sacrifice. The animal is being raised in a manner that is torah observant and therefore will not be disqualified due to its environment. 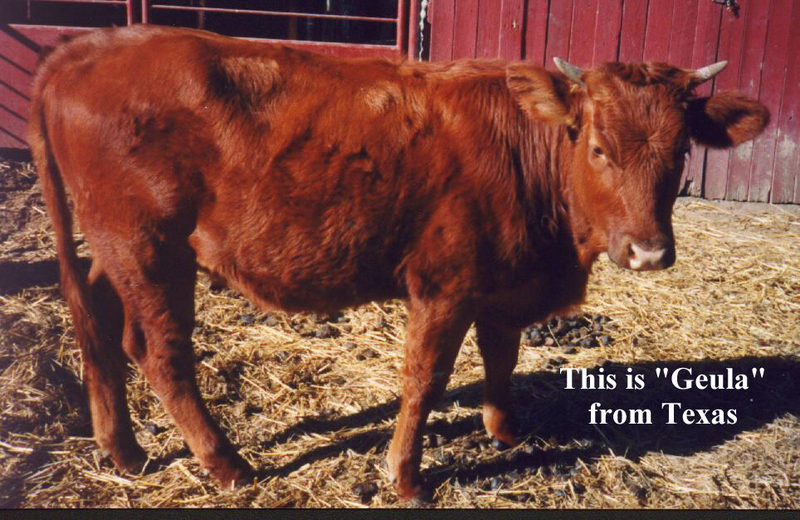 In the past there have been a few other red heifers that have been born but eventually became disqualified for one reason or another such as a few hairs of a different color on the animal besides red. There is a tradition that a Red Heifer will usher in the Messianic age. April 09, 2002 In March of 2002 a red heifer was born in Israel. After the heifer's owner contacted the Temple Institute on April 5th, Rabbi Menachem Makover and Rabbi Chaim Richman traveled to the farm where the heifer is located, to inspect and validate her status. The rabbis found her to be kosher and were satisfied that this heifer could indeed be a candidate to be used in the process of purification of the Temple as described in the book of Numbers, chapter 19. This is an important development towards the rebuilding of the Jewish Temple. There are reports that since this time this red heifer may have been disqualified. It is unconfirmed that there are however acceptable red heifers available outside Israel 10/25/05. November 10, 1994 On November 10, 1994 orthodox rabbi Chaim Richman with the Temple Institute was able to observe and certify that Clayed Lotts cattle (red heifer) was acceptable for the purification process and a return to temple sacrifice. There are now Red Heifer's that qualify for Temple service. Rev. Clyde Lott (601-859-2492) with the not for prophet Canaan Land Restoration of Israel, can comment on their current status. Anyone wishing to help support the good cause of land restoration in Israel should contact Clyde. The high priest was cleansed with the ashes of the red heifer twice during the seven-day period (before the Day Of Atonement) as a precaution.